ASU one of only 7 U.S. institutions doing interplanetary CubeSat missions. The NASA-selected CubeSat will be designed, built and operated at Arizona State University and is one piece of the agency's larger mission to fully characterize the water content at the lunar South Pole in preparation for exploration, resource utilization and improved understanding of the moon’s geologic history. The spacecraft, called the Lunar Polar Hydrogen Mapper, or “LunaH-Map” for short, will produce the most detailed map to date of the moon’s water deposits, unveiling new details about the depth and distribution of the ice that has been tentatively identified from previous missions. Confirming and mapping those deposits in detail will help NASA understand how much water might be available and will help inform NASA’s strategy for sending humans farther into the solar system. “All of our previous NASA mission involvement has consisted of us having instruments on other people’s missions. This is ASU’s first interplanetary mission – this is our mission, our chance to trail blaze,” said Jim Bell, professor in ASU’s School of Earth and Space Exploration and mission deputy principal investigator. “It’s a privilege to be leading this fantastic team, and I want to make sure we do it right and deliver on our promise to NASA,” Hardgrove said. CubeSats are part of a growing movement that is revolutionizing space exploration because of their small size and low cost of construction and operation, effectively opening the door to early-career scientists, providing them an opportunity to operate missions of their own. “How much good science can we do with these small missions? We don’t know the answer, but we will be one of the first groups to try to answer the question,” Bell said. Although this is one of NASA’s first forays into deep-space science experiments with CubeSats, the technology isn’t new to NASA and universities, which have recognized their value and have been building them for years. LunaH-Map will be designed, built and tested on ASU’s Tempe campus, in partnership with NASA’s Jet Propulsion Laboratory and several other partners supplying space-qualified hardware and services. LunaH-Map leverages technology from at least six small commercial space companies with expert knowledge and experience in building spacecraft hardware: Radiation Monitoring Devices, Busek, KinetX, NASA’s Ames Research Center, Catholic University of America, and Planetary Resources. Overseeing all aspects of the spacecraft engineering is the mission’s chief engineer and co-investigator, Jekan Thanga, an assistant professor in ASU’s School of Earth and Space Exploration. Much of the design and development of LunaH-Map will be done in his Space and Terrestrial Robotic Exploration (SpaceTREx) Laboratory and clean rooms in ASU’s state-of-the-art Interdisciplinary Science and Technology Building 4, which with their glass windows offer an opportunity for visitors to watch the spacecraft being built, tested and operated. In total, there will be 15 to 20 ASU professionals, including students, working on all aspects of the design, development, testing and delivery of the spacecraft. LunaH-Map, along with a number of other deep-space CubeSats, is a candidate to fly to lunar orbit on Exploration Mission-1, the first flight of NASA’s Space Launch System (SLS), which will be the most powerful rocket ever built and will enable astronauts in the Orion spacecraft to travel deeper into the solar system. NASA will provide several CubeSat missions spots on the maiden SLS mission. But just because it is small, doesn’t mean it is less sophisticated – in this case, as with our smartphones, size doesn’t compromise capabilities. LunaH-Map’s design allows for all the necessary sensors and instruments to be securely packaged inside. A jack-in-the-box-like deployer releases the spacecraft and panels pop out like little wings. LunaH-Map will map the hydrogen content of the entire South Pole of the moon, including within permanently shadowed regions at high resolution. LunaH-Map will measure the bulk hydrogen content, up to a meter beneath the lunar surface, while the instruments on both Lunar IceCube and FLASHLIGHT will tell us about the very top few microns. LunaH-Map will create the highest-resolution maps of regional near-surface (top-meter) water-ice distribution across the entire South Pole of the moon. “Science is a human endeavor, and part of that is knowing each other and trusting each other. And when it comes to a NASA mission and taxpayer dollars to do exploration, you got to have the credentials. You have to be trusted, you need to have proven yourself, you need to show that you can make it happen and you won’t fail. And we’ve got a history now where that’s the case,” said Linda Elkins-Tanton, director of ASU’s School of Earth and Space Exploration. The ASU Office of Human Resources announces the promotion of Erin Ellison from interim director to director of the Office of Equity and Inclusion. The ASU Office of Human Resources announces the promotion of Erin Ellison from interim director to director of the Office of Equity and Inclusion. In her new role in the area of employment compliance, Ellison ensures an equitable and inclusive workplace environment for faculty, staff and students. Ellison joined Arizona State University in September 2014 as a senior equal employment opportunity (EEO) consultant. In that role, she worked on complaint investigations, trainings, conflict resolutions and EEO-related law and policy application. 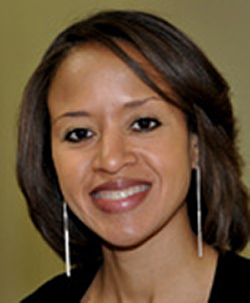 She has extensive experience in investigations, affirmative action, mediation and educational equity. Her previous employers include the Metropolitan Council (Minnesota), the City of St. Paul Department of Human Rights and the U.S. Equal Employment Opportunity Commission. Ellison, who begins her new position on Aug. 31, has a Bachelor of Arts degree from the University of Minnesota-Twin Cities and a law degree from William Mitchell College of Law. As a judge advocate in the U.S. Army JAG Corps, Reserve Component, she is knowledgeable about the military’s equal opportunity policies and Sexual Harassment and Assault Response and Prevention (SHARP) programs. The Office of Equity and Inclusion is a unit of the ASU Office of Human Resources. To schedule a consultation on diversity strategy with Ellison, contact her at 480-965-5057, or visit the Office of Equity and Inclusion online.